Harbor porpoise. Photo courtesy of the National Park Service. Harbor porpoises are the most common cetacean in the Salish Sea. 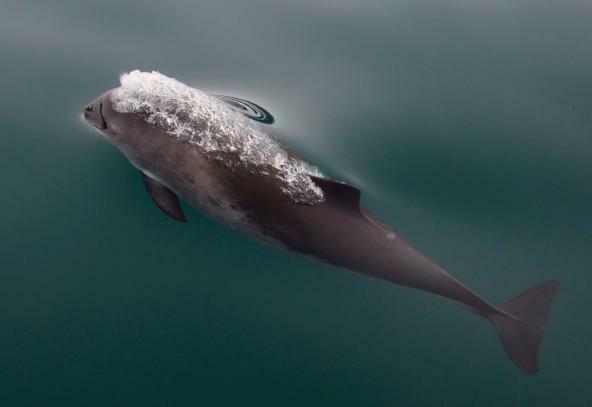 A new study off Fidalgo Island demonstrated that photo-identification can be used to track harbor porpoises long-term and revealed how their group structure is influenced by factors such as season, behavior and calf presence. It was found that many harbor porpoises regularly return to the area, indicating some level of residency. This study demonstrates the importance of understanding harbor porpoise populations at the local level. Elliser, C. R., MacIver, K. H., & Green, M. (2017). Group characteristics, site fidelity, and photo‐identification of harbor porpoises, Phocoena phocoena, in Burrows Pass, Fidalgo Island, Washington. Marine Mammal Science. CINDY R. ELLISER1 and KATRINA H. MACIVER, Pacific Mammal Research, 1513 A Avenue, Anacortes, Washington 98221, U.S.A.; MICHELLE GREEN, Department of Animal Science and Illinois Natural History Survey, University of Illinois at Urbana-Champaign, 1503 West Maryland Drive, Urbana, Illinois 61801, U.S.A.